Gild Hall is a boutique hotel located in the historic Financial District of New York City, defining a hidden side of Wall Street Hotels where finance, film, music and tech meet. Amid the gold and brass of Wall Street, you’ll find leather and bone of an Aspen country house, by star designer Jim Walrod. 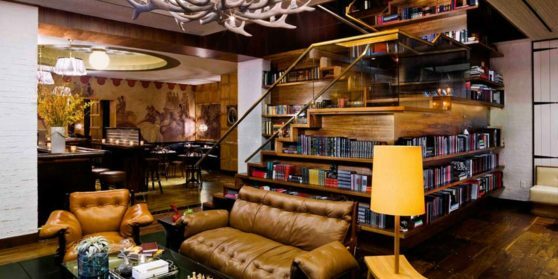 After a cocktail in Gild Hall’s clubby library lounge, the warm wood paneling of Felice beckons, with its Tuscan-rustic goodness. Next, it’s on to the upper-level hideaway wine lounge and bar, sporting tufted leather banquettes, candlelit ambiance and an admirably well-curated collection of Italian vintages. Chic design elements and flawless, sophisticated service make Gild Hall one of the best hotels in the Financial District of NYC—and an ideal place for bespoke Lower Manhattan social and corporate events.